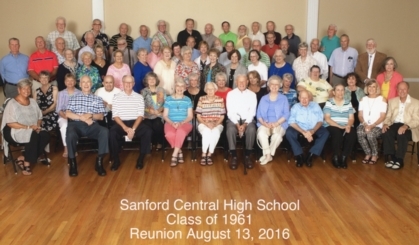 Welcome 1961 grads of Sanford Central High School. Enter your email and password and click Log On. Forgot your password? Click Forgot Password? After you have logged in, make sure you check out all the buttons on the toolbar. Content on this site is intended for only the members of the Sanford Central High Class of 1961 and guests. This website is owned by the Sanford Central High Class of 1961 and the content was created by our class. This website is absolutely free to the members of the Class of 1961 and guests. Your information on this website is not made available to anyone. PRIVACY NOTICE: All contact information (address, phone number, e-mail address) entered into this website will be kept confidential. It will not be shared or distributed. Your contact information is private: your street address, e-mail address, and phone number cannot be seen by the classmates unless you grant permission on your Profile. When someone clicks on your name, the only contact information they will see is your city and state and whatever information about yourself you choose to put on your Profile.